Mould your relationships into more special ones by sending this Heavenly Ready for Romance Ultimate Premium Arrangement to the people you adore. 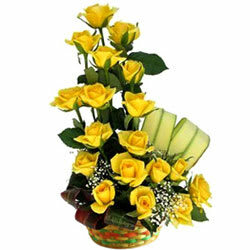 This Glorious Arrangement of Flowers includes 15 Yellow Roses trimmed with Greenery. Offer the special people in your life this Glorious Soul Mates Forever Premium Arrangement and make their hearts leap in joy. This simple and stunning Arrangement is decorated with 18 Yellow Roses designed with Leafage. Offer the special people in your life this Glorious Soul Mates Forever Premium Arrangement and make their hearts leap in joy. This simple and stunning Arrangement is decorated with 24 Yellow Roses designed with Leafage.